I'm waiting to log in. 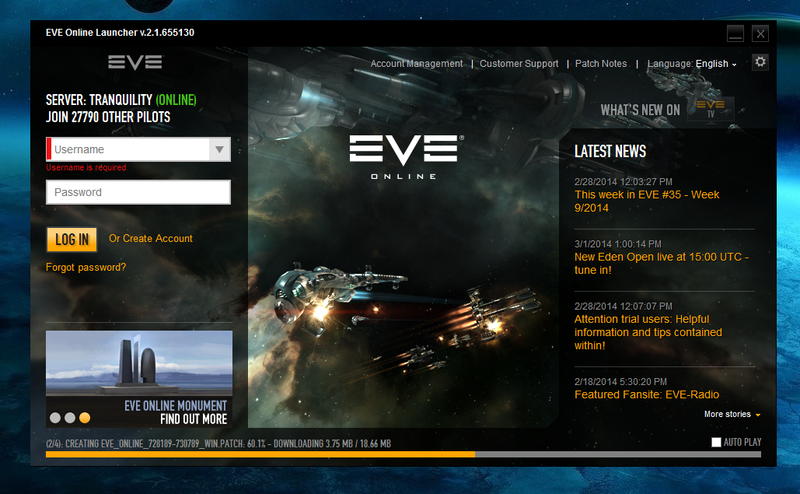 My launcher needs to patch so I set it up, made some popcorn and wandered back to see it patching away. I also noticed that there was a new background image. My first thought said, "a New Eden Open background?" But, no. It was an Atron and a Rifter fighting. I might not have thought much beyond that if not for the Hyperion above them. The Hyperion is a Combat Battleship designed for frontline fighting. Development: Recognizing the necessity for a blaster platform to round out their high-end arsenal, the Federation Navy brought in top-level talent to work on the Hyperion. The result: one of the most lethal and versatile gunboats ever to take to the dark skies. If I come back to the land of the player I could say, "Oh the Rifter is being redone, what a cute shot." Except, the Hyperions are there. Two of them and in the background there is a fleet of other, fast ships. Tackle.. support... this is a battle going on. Often, the screen shots herald things. Sometimes they are just images as well but my mind, deprived of Tea wants to know if this is hte first whispers of the next stage of this new Arc the game has entered into. The one where the empires are losing control. Where the news stories paint the edges of an image where all empires will be at war with each other. Fanfest is in two months. Ribucon is having a 1.3 release full of very nice small scale things. Things that are being pushed out now instead of the summer. New ship skins have been found on SiSi. There are deployable placeholders that make the eyebrow raise. Is the summer going to bring us a shattering of the empires internal ties? Or are these simple crazed dreams of a not yet awake mind? By 'shattering of the empires internal ties' do you mean aligned militia fighting each other? I've always thought that would be interesting, but I think it could be hard with the distance between the warzones. I did. I'm not capable of writing clear thought it seems that quickly after waking up. I got excited. It may not be a direct frontal assault so much as a lack of allies and a more alone and struggling feeling? Maybe it will mean the expansion of planetary conquest outside of Molden Heath too. The last several bits of lore they've dropped do seem to support a theory like this. Republic Fleet and Fed navy had a dread fight over the refusal to hand over Midular's assassin, and I seem to remember there being some Amarr-Caldari tension over Tibus Heth being deposed.